Disclosure: I am a member of the Behr DIY Expert program and was provided Behr product for this project. All opinions and ideas are 100% my own. 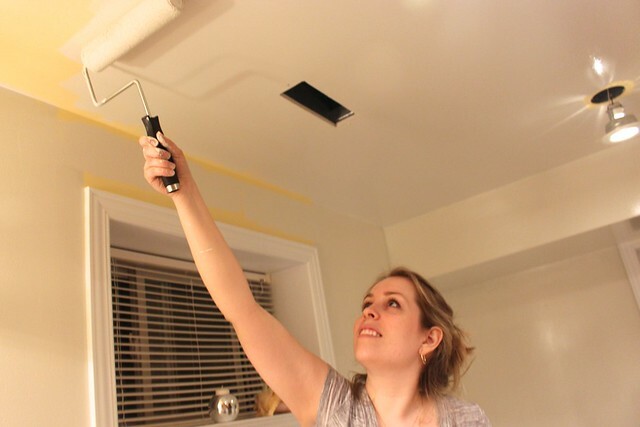 Last Spring, before we moved into the farmhouse, my mother made one request – would I paint her basement bathroom before we started our own renovations. 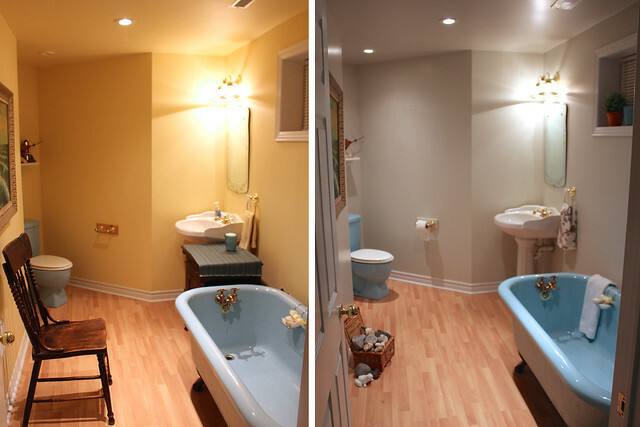 While she was away one weekend, I surprised her by transforming her bathroom from sunny yellow to a sophisticated grey. You see, my mom is known for picking different variations on her favourite paint colour “butternut cream”. It’s become a bit of a joke in our family, as every time she goes to get paint she comes back with something almost identical to what she already has. When she started looking at colours to repaint the bathroom, I encouraged her to get out of her comfort zone and pick something from the beautiful Behr Marquee colours. 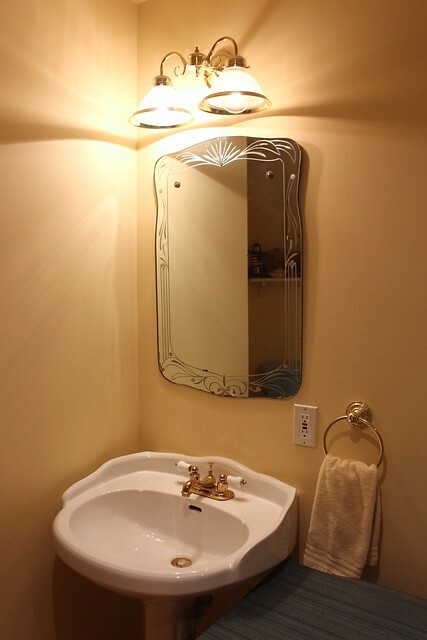 The bathroom gets no natural light, so it needed to be something light. 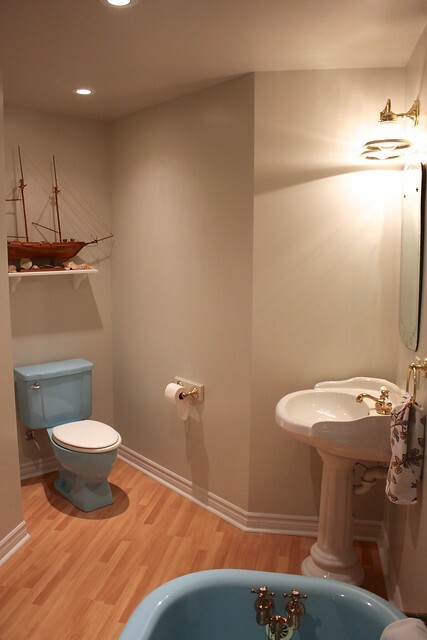 The other design challenge is the turquoise bathtub and toilet. My parents found this brand new clawfoot tub at a yard sale years ago. 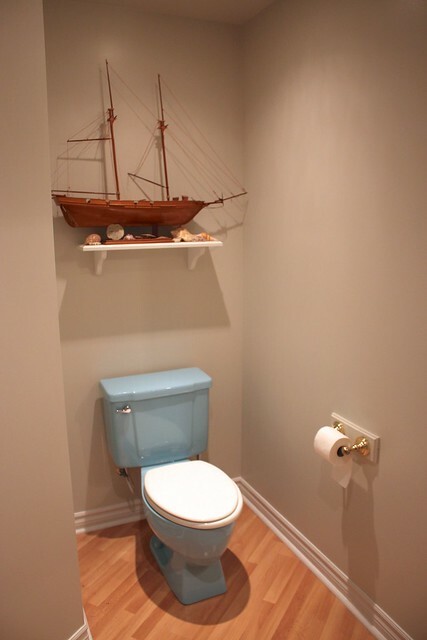 They were lucky enough to find a matching toilet still in stock at the time. 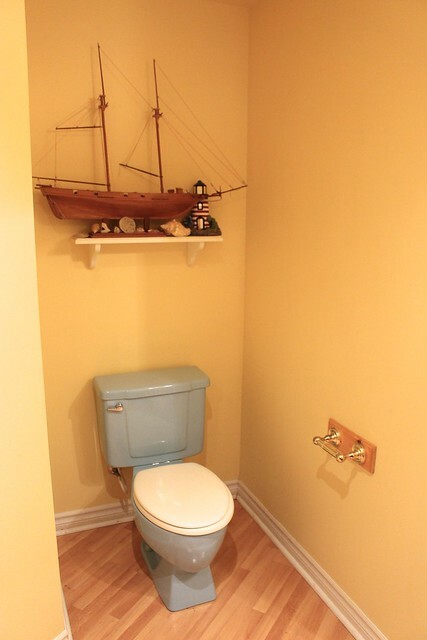 I’ve always loved that they’re a fun pop of colour for a small bathroom. When I look back at these pictures I can hardly believe that it was so yellow in this little room. Now that I’ve gotten used to the new colour, I can’t imagine it as anything else. 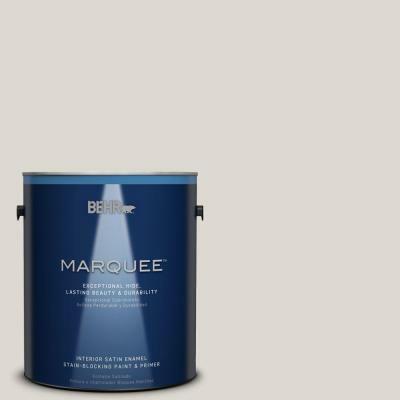 We chose Behr Marquee Satin Interior Paint in a warm grey colour, Ginger Sugar. I touched up the trim too with Behr Marquee Semi-Gloss Interior Paint in Cameo White. As tempting as it was to just crack open a can of paint, I knew there was some prep work first. I unscrewed all the face plates and vents, removed the towel racks and shelves, took down paintings and popped off the pot light covers. 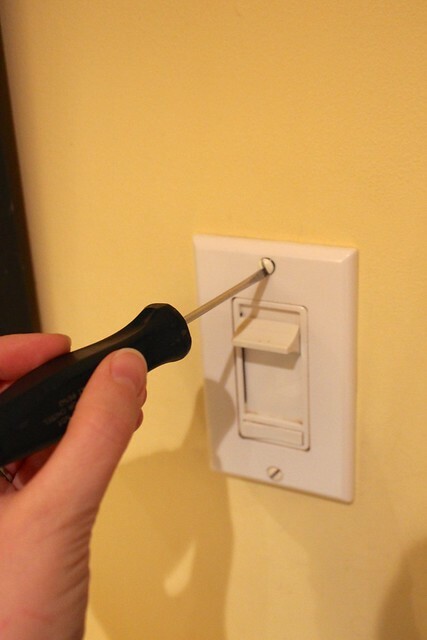 It only took about 30 minutes but it made such a difference in getting a perfect finish around all the fixtures. What I couldn’t remove, such as lights and the sink, I taped off with painters’ tape. I covered the floor, tub and toilet with drop cloths. The actual painting was easy. With Behr Marquee’s one coat coverage, I was able to do all the walls in one evening and then do the touch ups and paint the trim the next day. Not bad for a weekend project that completely transforms the room. I love how the warm grey colour makes the whole place feel serene. 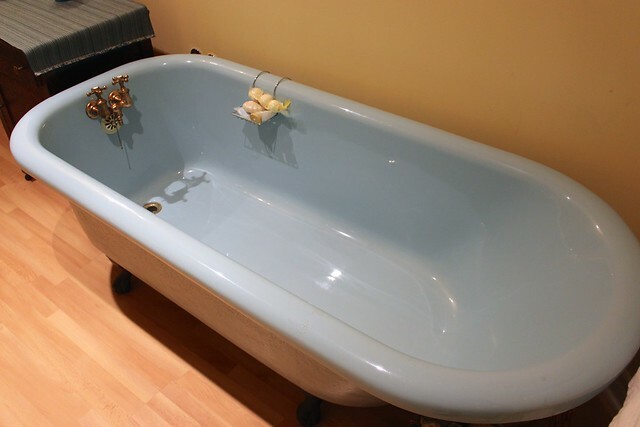 It would be so nice to come down here and have a nice long bubble bath in that big tub. 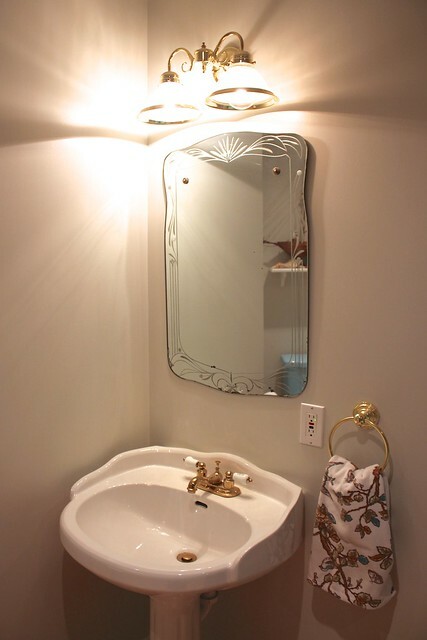 Originally we’d talked about changing out the brass fixtures, but now with the fresh grey colour they really sparkle. I always tease my mom that one day when she’s away I’m going to swipe that awesome antique mirror. 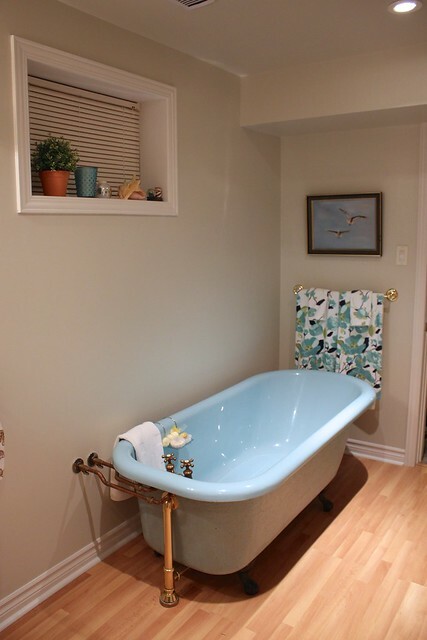 I love how the colour goes so well with the tub and the new towels. 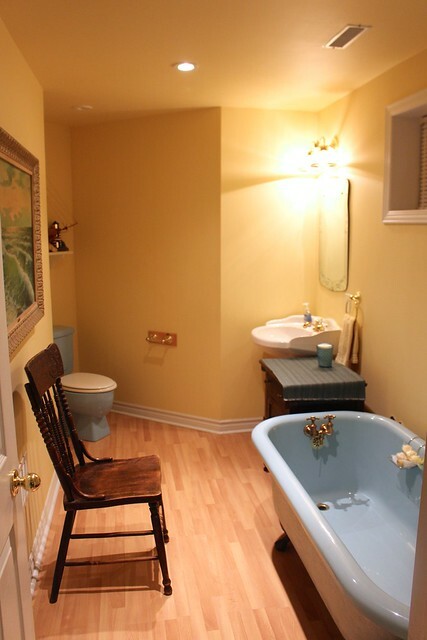 If anything, it now lets the tub be the star of the show, instead of competing with the yellow walls. I put the shelf back up with my dad’s model ship and our seashell collection from over the years. 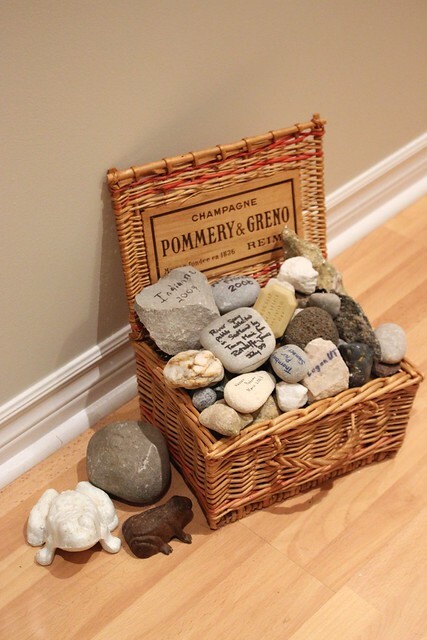 This is also where we store our family’s rock collection – everywhere we go, we bring back a rock and write down where and when we got it. We have them from all over Europe and North America. We even have some that have been brought back by friends and family. Every rock in there has a memory and a story. When my parents came back home, they were in shock to see the transformation. I love this colour so much that I’m even considering painting our powder room a similar colour when we start renovating it. It’s pretty amazing what you can do with a couple cans of paint and a weekend! Looks great! And I love the idea of the rocks. Thank you for posting photos! The color is beautiful. I’ve been trying to decide which color to paint my our rental and we have decided on this color. 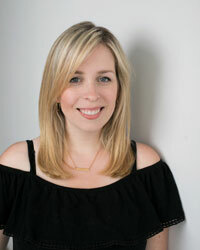 I could not have made this decision without this post so again, thank you! How sweet of you to paint for your parents! I love the finished look. Blessings to you?